This past year has been filled with learning to pressure can food. Anything and everything we could think of, that we knew we would eat, we have tried. I will say, some of our attempts were a bit disappointing, but for the most part, we have been pleased. As we are still learning new things all the time in this department of our lives, Minister QuietBuck and I are very happy with our decision on taking on this endeavor. An important note that she shared with me, is the lower the fat % the whiter the milk is after being canned. The higher the % the more color it will have like condensed milk from the super market shelves. She stated how simple it is, so we took the dare and canned several gallons of 1% milk. To this day, they are fine. How does one can milk from the grocery store? After sterilizing all the jars, let them cool down before pouring in the milk. This prevents the jars from cracking. Once the jars are cooled pour the milk to about 1″ from the top of the jar. (Refer to photo above) Always make sure to wipe off any drippings with a sterile cloth before applying the lids and rings. This is extremely important when canning any food item. If anything is left upon the rim it can cause bad seals or even cause bacteria and mold to grow. Also, if one touches the jars and does not ensure they are sterilized, bacteria can form and ugly ugly things can happen! Once the above steps are taken, ensure the lids are sealed tight, but not too tight that you can’t twist them off. Depending upon your altitude, you will need to learn the pounds for pressure. For us, it is 10 lbs on the weight. I put 2-3″ or so of water in the pressure canner. Once all the jars are in the canner, the water should not go over the lids. When I have finished placing all the jars into the canner and the water level is proper, I seal the lid. I turn the heat on high and wait for the famous whistle to go off for 10 lbs. I then place the weight for 10 lbs on the steamer nob while watching the needle rise for the correct pound amount. (Again, due to altitude, your lbs may differ) Once it hits the 10 lb point, I adjust the heat to keep it at 10 lbs. You do not want to go below or above the level of your altitude. It must be kept steady. Initially, I canned milk in quarts, however we decided that was too much for our needs. Now I only can milk in pints. If you choose to use quarts, what I did was put the timer on 5 minutes after the the canner went to 10 lbs. After the timer went off, I turned off the heat, not removing the pressure canner from the burner until it was time to remove the weight and canner lid. For pints, however, once it begins to whistle then weight placed on; as soon as it reaches 10 lbs, I turn off the heat immediately. Again, not removing the canner from the burner. Once the lb arrow goes down to zero, I first remove the weight to insure all the pressure is let out. (We don’t remove it sooner) I then remove the cover and jars, placing them on towels on the counter to cool off. (The towels prevent cracking as well) Soon the plink plink plinks will begin, sharing with us that they have been properly sealed. Once they are cooled off enough, remove the rings and wash the jars. Especially around the threads of the jars. Leave the lid alone, as that may still be a bit sensitive, but most likely not. You can clean that later after they are all cooled off. The milk can dry up and create a super glue effect that can make for some difficulties later on. Always test the lids to insure they are truly sealed before putting them away. We then date them and store them away until needed. Simple as that!!! •Another side note, inside the jar, there will appear to be tiny white balls. Those are fine. Nothing to worry about. You may have noticed them in the photo above. I use the milk when making breads mostly or scrambled eggs and omelets. We’ve also used them in cereal if we run out of milk from the fridge. I must say, none of us have gotten sick nor died, so we know they are good! This is the All American Canner we have in our home. Initially I felt quite intimidated by the idea of canning. That big ole cooking thing with some whistling numbered whatchamacallit had me in the stages of…well, we can do this tomorrow. (There is nothing to fear but fear itself came into play as tomorrow became almost a week.) I was quite overwhelmed by this monstrosity! I avoided it for as long as I could for fear of the lid exploding off, something bad happening, hearing in my head “be careful, you might poke your eye out!” However, we were Successful!!! No traumatic events happened at all! No cracked jars, no burns on us, not a single thing went wrong! It was an expensive item that we thought long and hard on, and I believe it is one of the best tools we have in our home for preserving food! 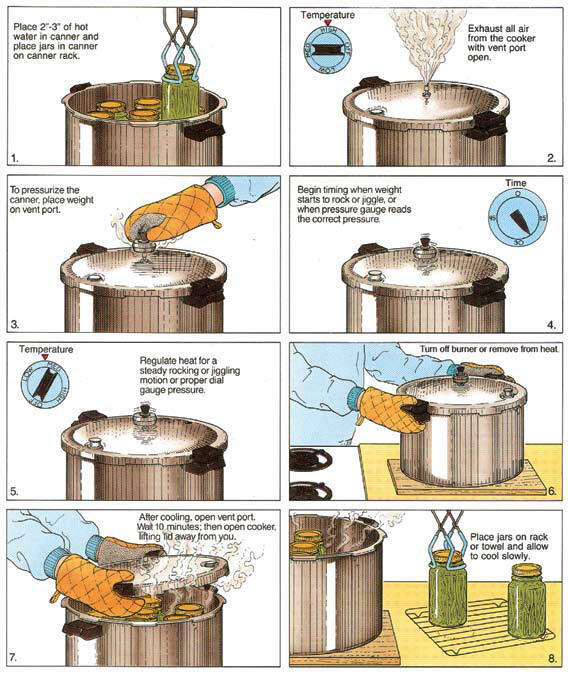 Here is an illustration from a great site on canning all kinds of food. One thing to note is how very important it is to insure to adjust the burner temperature accordingly for anything you can. If you keep the heat on high, it can affect the lbs/time. You want the weight to stay at the lb limit for your altitude. I find that when I turn the heat to a tich above Medium heat it holds the 10 lbs perfectly. Our very first project was canning meatloaf of all things. We are still enjoying them. They do end up looking like canned dog food, but the flavor is amazing! My daughter’s friends always ask for the meatloaf when they come over! So, even kids enjoy it. Other items we have canned are potatoes, carrots, squash, sweet potatoes as a few examples. Our potatoes had mixed outcomes. (as revealed in another post titled Canning Potatoes ) Some were fantastic, others not so much. We believe the amount of water in the jar effected the outcome. In conclusion, for anyone interested in canning…do not be intimidated by it. It is rewarding, fun and beneficial during these times. 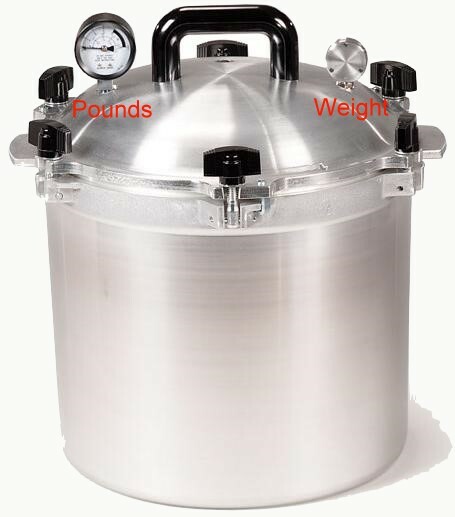 It is a huge money saver, even after the investment of the Pressure Canner itself. We have cut our grocery costs more than half. Now we only run for milk and a few basics more than anything. I encourage everyone to learn this wonderful technique for storing food. and our own personal experience. Many are using Mylar for their food storage needs, specially for long term food storage. After researching we did the same for our food storage by making our own MRE’s (meal ready to eat) using Mylar bags. We never did the Mylar in a 5 gallon bucket as we are only doing 2 gallon buckets. The Mylar seemed to work well at first, even easy to use and seal. But after months in storage and doing a check on them. We realized the Mylar had failed even though they were still sealed. Out of 50 MRE’s not a single Mylar bag held its vacuum seal. Not to mention our hard candy and other small items were melted inside the Mylar bag MRE. Yet the same items stored outside of the Mylar did not melt. In turn showing that Mylar retains, absorbs or reflects heat within the bag. We have since removed all of our Mylar stored items and re-packaged them in buckets or Mason jars. We re-designed our MRE’s to be 1 month of food stored in a 2 gallon bucket instead of 2 days of food for 3 people in a Mylar bag MRE. This makes it easier for a BOB (bug out bag) situation. As each person now only has to grab their BOB and 1 bucket MRE (30 days food). Instead of having multiple MRE’s stored in our BOB’s along with another duffel bag full of MRE’s to carry between the husband and I.
I have seen many videos of stock piles of TP. And all I can think is, “wow, so much real supplies could fit there instead”. The wife and I have talked about this issue and then came across a video that gave us the idea. Go back to the old school methods. Use pieces of cloth instead of TP. We wash (hand, machine) diapers and underware, so what is the difference with wipe-able squares? Store a pile of cloth squares from old sheets and such. And a pail to put the dirty ones in, like a diaper pail. Not only is TP not an item to stock and to take up room. It is also removed from the expense list, which is a good thing. Average Queen sheet yields about 600 squares or a stack the size of 1 roll of toilet paper. Yet the stack is equivalent to 30+ rolls of toilet paper. All for the price of 1 used sheet. Along with TP, I often see bundles of paper towels stocked away in videos done by preppers along with paper plates, cups and plastic silverware. Why waste that amount of space? Why waste that amount of money? Take a trip to Odd (Big) Lots and pick up a few dozen cloth wash packets. Normally they are $5.00 per dozen so $10.00 and never a paper towel to buy again. For plates look into stainless steel steak plates. Being stainless, you’ll never buy the plate again nor will it rust or break. Same with cups and mugs. Use a mason jar or look into stainless steel milkshake cups. Why waste your money on paper items that go from the store to your trash can? Remove another item from the expense list. Many have a garage full of electric and air tools. And they are great items to have. But if we go into a SHTF situation, there is a high chance we will not have electricity. In turn making these tools worthless. And if we get an EMP one way or another, again the tools are worthless. So one must think early 1900’s or so and stock up on good old hand tools. Hand augers, hand planes, hand crank drills, and saws (bow ,2 man, hand, etc). These are often easy to find on Craigslist or at your local antique dealers for less than you would think. A bath of baking soda and white vinegar often cleans up the rust and blackened handles. Most preppers are focused on guns, guns and more guns. Which is a simple method but has one major flaw. One can only store up so much ammo. After the ammo runs out the gun is worthless. To think around this, think re-usable. A long bow or compound bow is a good place to start. As arrows can be used over and over and even made if need be. A sling shot is another good item as any rock or projectile can be used. And with YouTube, you can learn how to turn your sling shot into a sling bow, meaning it shoots arrows as well. Many stock up on flashlights and other useful devices that take batteries. And many are stocking up on batteries as well. But batteries die over time so one cannot store them forever. One should think around this and store more items pertaining to fire. Such as flint strikers, actual flint rock with a cast iron striker, magnifying lens (burning ants? ), a few Zippo lighters along with extra flints and wicks. As anything flammable can be put into a Zippo as a fuel source. Stock up on emergency candles (bulk soy wax in pint mason jars) or lamp oil for oil lamps. This I would store in at least 5-35 gallon size containers, not bottles as they tend to leak. Many people are stocked in their kitchens of cookware. Nice pots, pans, skillets, lids, etc. But can any of these items handle an open camp fire? The blasting heat from a rocket stove? Can they handle sitting on top of a wood stove for extended periods of time? Able to sit inside an adobe oven? Most likely the answer is no. As the paint would bake off, the plastic handles would melt and the thin coatings on the cookware would begin to peal. Think old days, think ever lasting, think easy clean up. Think cast iron. Replace your kitchen with cast iron cookware and you will never buy a piece again, never have to use soap on them nor find room in the dishwasher for them. And you have never tasted a perfect brownie till you make a skillet brownie. Cast iron can be used in all forms of heating methods and is great for campers and the Boy Scouts. So why not for when SHTF as well. We just love cooking with cast iron now that we re-found it. These are just a few ideas/tips that we have learned over the years from prepping and watching others. The husband and I have researched food storage for a good part of the past few years. From watching and reading what many others have done, we came up with what we deemed as important. Removing the errors others had encountered. A big one most do not see is in the storage of 5 gallon buckets of food. When you break the seal, you have 5 gallons of food (rice, beans, etc) to eat or it will spoil. One cannot say they will reseal the bag since most likely there will be no electricity. Not to mention hard to transport 5 gallon buckets in an emergency. People have good intentions, and many good ideas. But few have the ability to think things through thoroughly. Our MRE is designed to be enough for 2 people and 2 cats for up to 48 hours or 3 people for at least 24 hours. Each MRE is less than $5.00 to put together ($1.25 per person per day). Many items that others incorporate into their MRE’s or food supply we have incorporated into our BOB’s (bug out bags). Such as stainless water bottle, spork, rubber bowl, bandanna (napkin) and so forth. Our MRE set up is focused solely on the meal itself. All items fit inside a 1 gallon Mylar bag with 2 oxygen absorbers added.